Freshy fresh in my mouth! Sometimes salads can be so so good. This week it was my birthday! Wait, did I already say that? I think I might have also already mentioned that special love that I have for pressies and gifts and pretty things with bows on them. I am so lucky because I got to have three little birthday shindigs – one with my family, one with Bjork’s family, and one with Bjork. Romantical birthday dinner dates are his specialty. But then something not so lucky called I logged into Amazon two days before my birthday happened. Nononononono. Sometimes it’s like my brain is not even on. Right there at the top of the order history was this gorgeous new Canon lens burning a hole through the screen. Mmk, let’s think this through. We share an Amazon prime account (♥) so our purchases are listed together. I did not order a lens, and Bjork did not tell me he ordered a lens. My birthday is in two days. So then I have to either a) jump up and down on the couch to express my joy about this most awesome ever gift, or b) cry, because I love love love surprises and my birthday surprise is not going to be a real surprise. I went with option A because A NEW LENS! Bjork knew that I knew, but obvi he still wrapped up the present and let me open it on my real birthday because he’s sweet like that. So here is the debut of the new lens with this spingy quinoa salad and honey lemon vinaigrette! I am kind of paranoid to tell you that this is its debut because I took these photos in such a pre-salad-eating hungry girl flurry. I love two or three of them (and a few of my unpictured practice shots) aaand the other ones are sort of struggling to get by thanks to my Minnesota nasty weather late afternoon light. But regardless of the light, I knew right from the first shot that I was going to like this lens. I literally I took one single photo of a lemon on the wood table and birthday-present-screamed to Bjork into the other room: OMG I LUV IT!!!!!! Thank goodness none of the rest of you have to live with me. Up down and all around. For you photography peeps who like to know all the techno-details, this is a Canon 2.8 100mm lens. I have a Canon 7D and up until now I was using a 50mm 1.4 (which I also lovey) but sometimes I like to get in really obnoxiously close to the food so you feel like it’s right up in your face. And this lens is how I’m going to be able to make that happen! I have a lot to learn about photography in gen and also about using this lens. And I couldn’t be more excited. Learning is good. Rah rah for birthday gifts that inspire learning! Rah rah for salads that taste like a fresh party! Think about these ingredients for a second: quinoa. peas. feta. bacon. fresh basil. 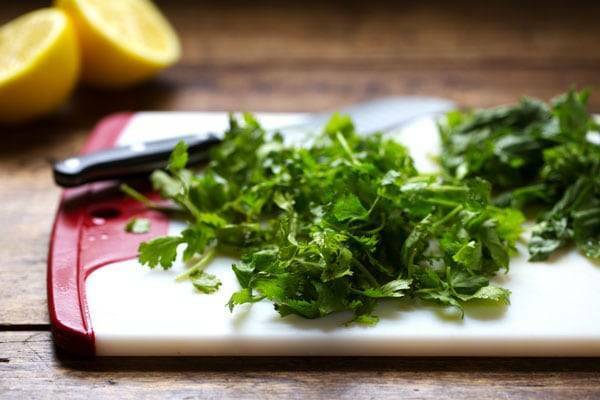 fresh cilantro. almonds. honey lemon vinaigrette. Now think about yourself eating those ingredients and feeling healthy and happy and full. I can imagine this easily because it’s all I’ve been eating in the last 24 hours. Tossed with some spinach and a handful of good crackers (okay fine sweet potato chips) and BAM. Power meal. How many hours till lunch? 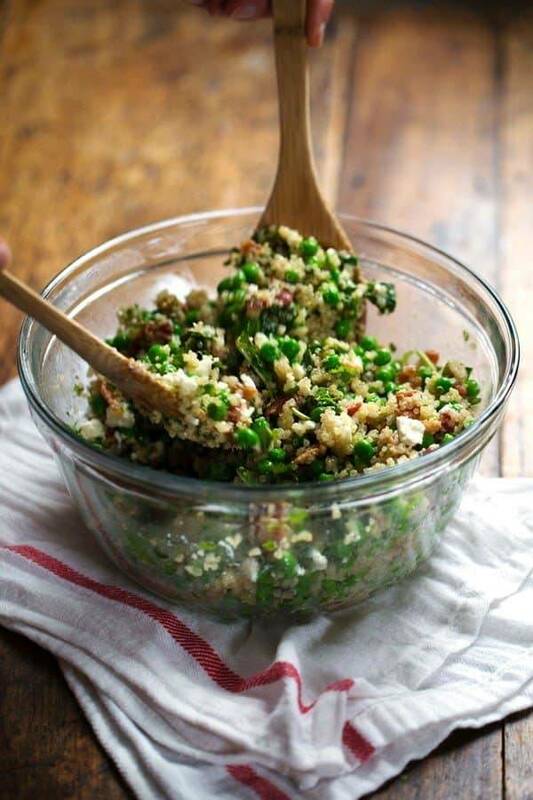 This Spring Quinoa Salad has quinoa tossed with peas, fresh herbs, feta, bacon, and almonds, plus a homemade Honey Lemon Vinaigrette. Cook the quinoa according to package directions. I make this the night before and let it chill in the fridge so it separates better for the salad. Bring a pot of water to boil and then turn off the heat. Add the peas and cover until bright green. I do this instead of regular boiling so they don’t get wrinkly! 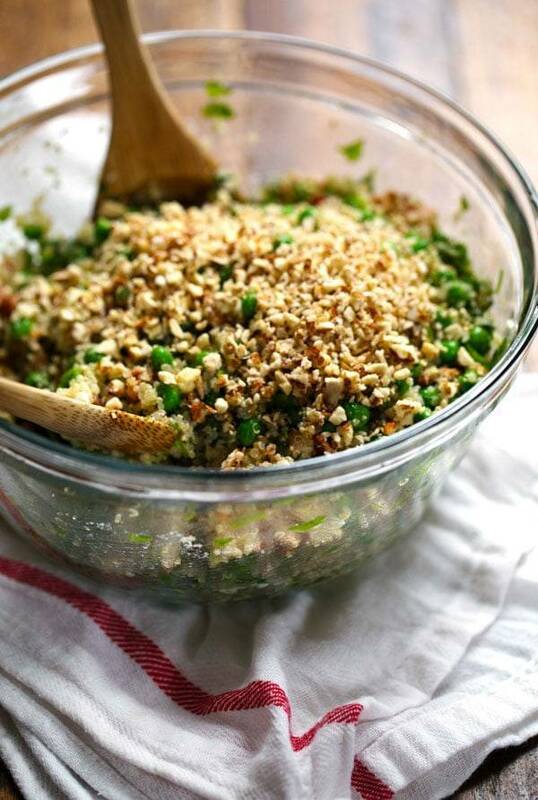 Toss the quinoa with the peas, feta, bacon, herbs, and almonds. Puree all the dressing ingredients in the food processor. Toss the dressing with the salad ingredients. Season generously with salt and pepper. Serve tossed with fresh baby spinach, on crackers, or just by itself! The tossed salad can be kept for up to two days without getting weird – it actually soaks up the dressing, and it works great to toss the leftovers with fresh greens. Also, in my opinion, you can never have too much fresh herb-age and mint would be a great addition. It’s Wednesday! Baby steppin’ our way to the weekend. I was JUST telling my fiancé how much I LOVE quinoa and wanted to work on some quinoa recipes this weekend. Gotta give this one a try! Because with Feta and Peas, how can you go wrong?! Looks awesome!!! Happy Birthday too by the way! Hope it was a memorable one! Thanks AJ! 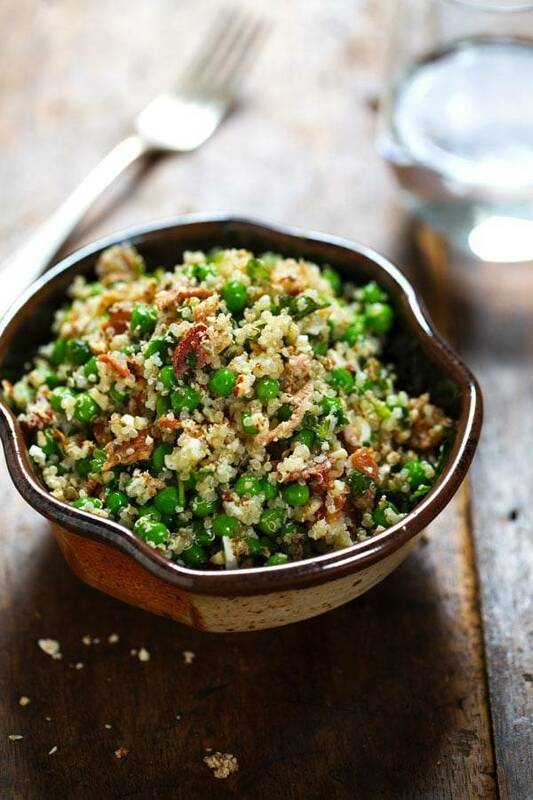 This is a great starter quinoa recipe for you. 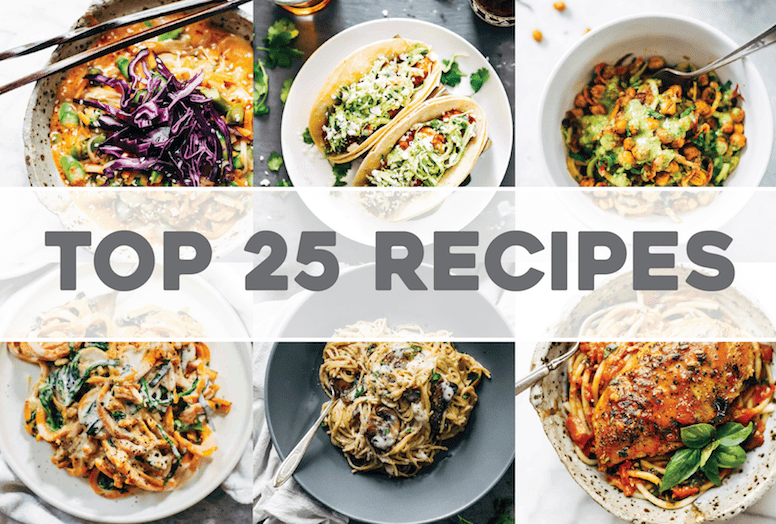 Also, A Couple Cooks has lots of good quinoa recipes! Check them out, too. I hate being so predictable with the quinoa/food blogger thing, but right now I’m totally loving it in stuff like this. Have you worked with Red Qunioa before? I saw it at whole foods and been meaning it try it but it’s like twice the price. Wonder if it’s really worth it? Oh what a pity with the lens and Amazon and all, but your hubby sounds so sweet! Feel blessed to have such a wonderful man by your side! 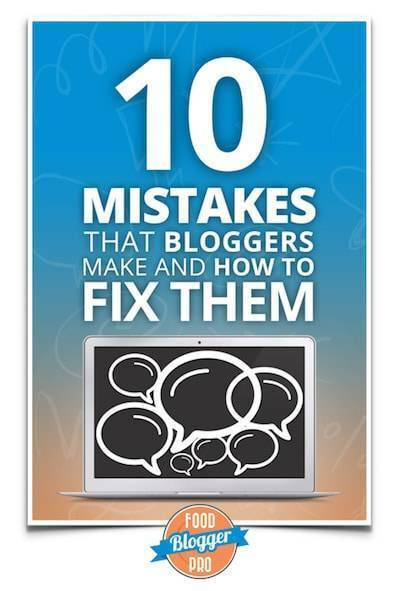 Love your blog, your recipes, your photo tutorials, just everything! And the salad is already on my imaginary grocery list. Thank you Regina! So glad you like the site. Oh, and HAPPY BIRTHDAY, of course! How could I forget about that?! This makes quinoa actually look amazing (which is hard to do!). Bravo and happy birthday to you!! You can have individual accounts on Amazon (your own log on) and share the same prime account. Does that make sense. My husband and I have separate accounts with Amazon (we can’t see each others purchase history, he can’t use my gift card balance, preferences are mine) BUT we both use one prime account. I believe you can link two accounts to one Prime. For future reference. Happy belated Birthday! What a great present!!! Jennifer, you just BLEW MY MIND. I am so excited! looking into this asap! Yerm! This looks great, although I’ll probably amp up the herbs and take out the cheese and bacon. Thanks for posting! I always like when people play around with recipes like this… it’s so customizable! Hope you like it Liz. Wow a new E-book ; congratz! Also happy b’day! i recently just had mine too. The salad looks divine and so light too. You know how to make salad drool worthy. This pictures are gorgeous and the recipe looks wonderful! I had to check our credit card statement at christmas because of a possible breach. I learned that my husband got me a new Vitamix. I was overjoyed but disappointed that the surprise was ruined. I love it anyway! Oh no! Isn’t that the worst but the best all at the same time?! Ugh, so frustrating! But I’m sure you’re liking your Vitamix! Awww that’s so cute of him to gift you a camera lens!! That’s like a dream gift for us food-o-holics lol!! Happy belated birthday, Lindsay! Lenses always make the best birthday gifts, don’t they? I cannot wait to give this salad a try – yum! Like yes they do! Both “fun” and practical! Congrats on your new lens =) nice. Hmmm, is it bad that just today I learned how to pronounce quinoa? I’m kinda embarrassed about how I’d been saying it…..
Is this a safe place to say that I’ve never tried quinoa either? But I’m ready for the leap! Gonna do it. And I seriously love the way those peas set off your dish. Gorgeous! It’s on fire….. Okay, well I thought it was fah-ro, but then a smart healthy foodie said she pronounces is fay-ro. Maybe google knows?? okay wait! oxford dictionary online says it’s pronounced fah-ro. Win!?!? This looks like the perfect work-lunch salad! I have so much quinoa in my cupboard, but I have been ignoring it. I guess it is time to stop! Yay for new lenses, sweet husbands, and Birthdays!!! 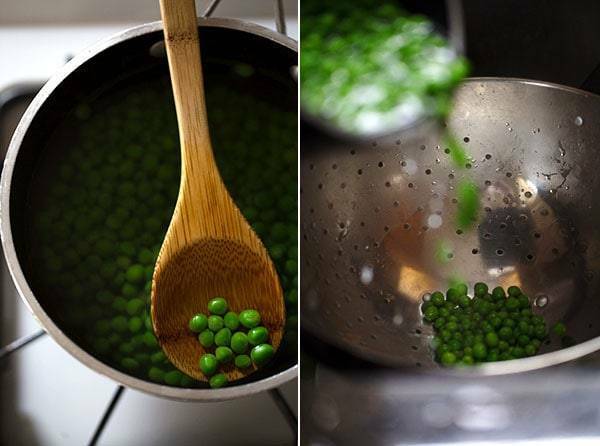 Hi Lindsay, beautiful photos…the peas look like little shamrocks without the…sham. I too dally with an old Pentax I’ve had since the 1980s…it still works great. I’m loving this salad idea…it’s fresh, super-foodie and all that good stuff. I have actually made something similar but without the feta and peas. I added shredded carrot, cut up broccolini and spring greens. I am going to make your version, sans bacon (veggie here), as it looks totally yummiful. Happy birthday, Ms. Taurus! Tauruses love a fine meal, for sure! Thanks for a super duper site. I am new to the wonderful world of food blogs and find yours most intriguing. You and your hubby do an awesome job! This looks great Lindsay! Perfect for weekday lunches. I’m totally with you on the Minnesota light thing. It was lightless and grey all last weekend, total bummer when there’s a pan of brownies to shoot! Happy birthday, Lindsay! Your photos are already amazing so I can’t wait to see what this new lens brings to the table. And…this quinoa salad looks phenomenal which is saying a lot because quinoa salads are everywhere and this one managed to draw me in, make me comment (which I rarely do) AND pin it. Um, yeah, that’s one good quinoa salad. You know what I also love? This salad!!! It looks phenom! And the new lens is super exciting! Can’t wait to see more of it, or more so what is shoot…oh you know what I mean! Hahaha – thanks Lindsey! Name sisters! Lindsay, that’s so so so exciting!! Both the yummy salad AND the new lens! My dad actually told me he’d buy me a new lens for my birthday last June once I picked one out, buuuuut… I kind of never did. I have a Canon though, so if you’re already in love with this one, maybe it’s about time I checked it out! 🙂 And still on the topic of my dad, he absolutely adores quinoa! Every time I visit, he offers to make a new quinoa dish for dinner, so I’m definitely sending along your recipe to him. He loves all things salad-y and healthy, so I’m sure he’ll put this on his to-make list! Your dad is so hip! I love it! Just one question, is it 1 cup of dry quinoa or 1 cup of cooked quinoa ! Happy birthday and congrats on your new lense. I keep also finding birthday presents as my OH is rather bad at hiding them. I love this salad especially with the almonds blitzed in. I’m so glad you told us what the lens was, Lindsay, because just at about the point you told us I was getting really antsy to know! The photos are gorgeous! I also love the idea of this salad. There are so many lovely tasty flavours rocking around in there! My husband and I love quinoa, and this salad sounds amazing. When the weather gets warmer here, I’ll definitely make this salad. I got so excited reading about your birthday gift! So happy for you! Happy belated birthday! hahaha! Thanks Shinee! I love the shared excitement! That salad looks so fresh! You had me at bacon, but basil and feta cheese and almonds are good too. I know all about the difficulty of getting surprised with gifts, shared bank accounts and all, it’s hard not to notice!